Kelly Rowland is pregnant. We honestly had no clue she is, and we can’t even believe we actually missed this bit of news. We did a quick look-up and it turns out, the singer revealed her big secret back in June. Congrats Kelly! On Tuesday, the former Destiny’s Child vocalist was spotted grabbing some juice at Pressed Juicery in Beverly Hills. What we immediately noticed about the soon-to-be mommy was how cool she looked in her maternity outfit. Kelly showed off her growing belly in a bright blue maxi dress and studded flat strappy sandals. She went for a hippie rockstar kind of vibeby topping the frock with a light blue chambray shirt and accessorizing with a printed bandanna. How do you like Kelly’s maternity style? And do you approve of her choice of accessories? The piece from Topshop is crafted from 100% polyester while the one from Emilio Pucci is made of 100% silk. 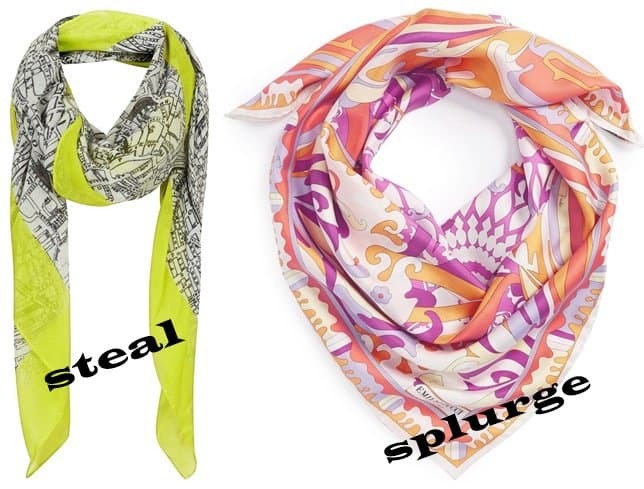 Both are gorgeously printed and will surely catch anyone’s eye if you wear one around your head. Team your choice of scarf with a bright blue maxi dress, flat sandals, sunnies, and a chambray shirt to complete Kelly’s style.